Weelam Ngalut (Our Place) in Woiwurrung Language, the language of the first peoples belonging to the Kulin Nation, we give gratitude and pay respects to ancestors of the past and leaders, who walk to the future with knowledge of time and country. Tarnuk ngayiga mil yagajen jagijinla goorijin bage. Look at the Tarnuk and the eye sees the work of the spirit of our ancestors. 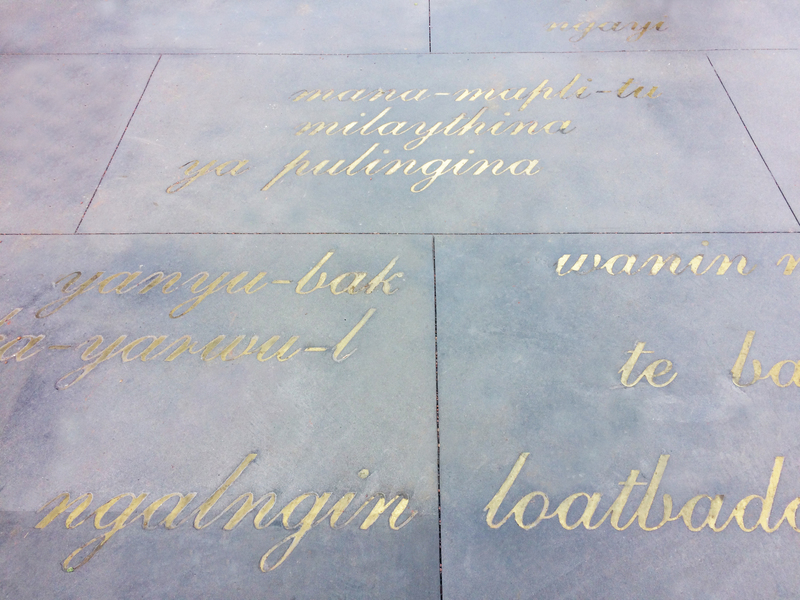 Weelam Ngalut (Our Place) welcomes students and visitors of Monash University to learn and speak languages of the First Peoples of Australian east coast – Koories, Goories, Murri's and Wik peoples. Weelam Ngalut (Our Place) marks our presence in the land here. Talk with us, learn with us and walk with us to a place of knowledge, a place of sharing culture and a place for learning. First we learn to speak, then we see the leaves of the trees in the path which guide us to the Weelam and the Tarnuk*. The Weelam is a form of Aboriginal architecture and reminds us of humbleness and the time before big buildings. It provides shelter from the wind and a place to have fire for warmth and cooking. The Tarnuk is a permanent water vessel for the home made from a gnarl in a big old tree, hollowed and burnt out by hand. Look closely at the Tarnuk, you can see the work of the ancestors. Sandra Delaney is a proud Noonuccal, Ngugi and Goenpul woman from the Quandamooka area, south-east Queensland. Jandai is the language spoken on Quandamooka country and is a dialect of the Yugerra language. As a child, Sandra grew up speaking certain words of her traditional language, as did most other members of the community. Now she is a passionate advocate for revitalising language and making it part of everyday life. Sandra has worked on a number of language revitalisation projects, including language workshops and, more recently, the publication of cultural and language resources. Sandra feels privileged to be able to support language retrieval in whatever way she can – with local families, community and organisations and in the workplace. Megan Cope is a Quandamooka woman, from North Stradbroke Island in South East Queensland. Her site-specific sculptural installations, video work and paintings investigate issues relating to identity, the environment and mapping practices. Cope's work interrogates and resists prescribed notions of Aboriginality and often employs psychogeography to challenge the grand narrative of 'Australia', as well as concepts of time and relationships to country in a settler colonial state. She has exhibited widely throughout Australia; her work was recently featured in the major national exhibitions Defying Empire: 3rd National Indigenous Art Triennial, National Gallery of Australia, 2017, The National, Art Gallery of NSW, 2017, and Sovereignty, Australian Centre for Contemporary Art, 2016. Cope is a member of Aboriginal art collective proppaNOW.